The most obvious characteristic of a precious or semi precious stone is color. 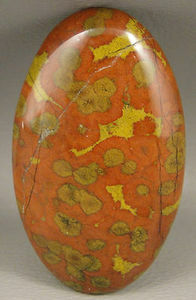 Cabochon stones come in a variety of bright colors and patterns. Certain semi precious gemstones have a consistent color, no matter what location they come from. Azurite is always blue, Malachite is always green, and Magnetite is always black. Though a good place to start, identification cannot always be made by color alone. There are other blue or green gemstones or black gem stones. Also some semi precious gems can vary in color. Turquoise can be blue or green or even white. Calcites can come in many colors. And an Alexandrite can actually change colors in different lighting! Is the gem cabochon transparent-light freely passes through, translucent-some light passes through, or opaque-no light passes through? 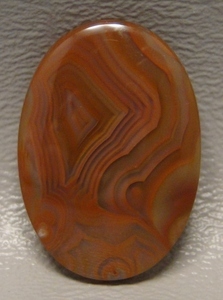 Most agates have some translucency, whereas jaspers are usually opaque. 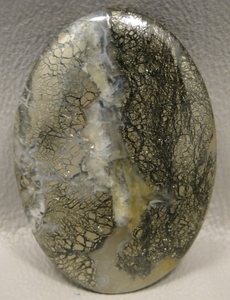 Cabochon stones can have light effects caused by reflection, interference of light or refraction. These effects include: Chatoyant or Cat's Eye-so named because it resembles the slit of a cat's eye. 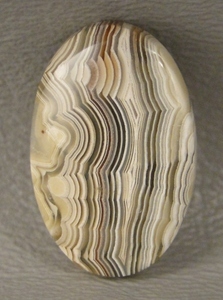 When the designer cabochon is moved the reflection glides across the stone. (Tiger-Eye and Selenite) Asterism or stars (Star Rubies), Aventurization-glittering reflections (Aventurine), Iridescence-play of rainbow colors (Opal fire), Labradorescence-play of colors in metallic hues (Labradorite), and Opalescence-the pearly effect of common opal-not to be confused with the rainbow colors of opal. Certain minerals will show luminescence or fluorescence when held under an ultra-violet light. The cabochon stones will glow in bright colors! Fluorescence is caused by the presence of small metal impurities. The strength of the fluorescence and the hues can vary. The next visual characteristic of semi precious stone cabochons is luster. Luster is the appearance of the mineral in reflected light. The most basic categories for luster are metallic or non-metallic. Metallic is the luster finish on metals-bronze, silver, gold, etc. Non-metallic gem stones can be broken down into the following characteristics: silky-a fibrous look seen in tiger-eye or selenite, pearly, greasy, waxy, vitreous-glassy (the most common luster), adamantine-meaning diamondlike, or dull. When one talks about the hardness of a cabochon they are referring to its number on the Mohs' scale. Designed in 1822 by Friedrich Mohs, the scale list mineral rates minerals on a scale of 1 to 10. The scale simply means that any mineral on the list can be scratched by any mineral above it on the list. The scale is not proportionate-meaning that the difference in hardnesses is not the same from 1 to 2 as it is from 9 to 10. Diamond, the hardest known mineral is a 10 and cannot be scratch by anything else. However, hardness should not be confused with toughness. A diamond can be broken. Jade is the toughest mineral known and it is very difficult to break. You can conduct your own simple scratch test on the bottom of your gemstone cabochon. Here are some household items-a fingernail is about a 2.5, a copper penny is a 3, window glass is a 5.5, and a steel file is a 6.5. Magnetism is easy to test with a household magnet. Does it attract to the mineral? Generally only a nickel iron meteorite or the lodestone variety of magnetite are magnetic. Most other techniques to test gemstone cabochons require crushing or breaking the stone, or using expensive equipment. If you must know for certain, you should have the jewelry stone sappraised by a professional.